I’m proud to announce that in Spring 2019 I’ve finally finished writing my first book. 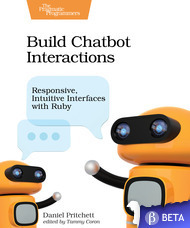 Responsive, Intuitive Interfaces with Ruby, Building Chatbot Interactions 2019, Pragmatic Bookshelf. 🛒 Direct purchase. This is the best way to support the book! You can find both ebook and print copies. The next step in the evolution of user interfaces is here. Chatbots let your users interact with your service in their own natural language. Use free and open source tools along with Ruby to build creative, useful, and unexpected interactions for users. Take advantage of the Lita framework’s step-by-step implementation strategy to simplify bot development and testing. From novices to experts, chatbots are an area in which everyone can participate. Exercise your creativity by creating chatbot skills for communicating, information, and fun.